I have finally figured out how the Volkswagen Group is going to pay the exorbitant costs of Dieselgate: it’s the Bentley Bentayga. It has 600 horsepower from a W12 engine, a $229,000 starting price, an interior so opulent it makes a Gulfstream jet look like a crack den, options that are cheerfully, unapologetically insane—and it’s poised to sell so well it might as well print money. I can’t believe Bentley didn’t make an SUV sooner, because this one is going to be a profit machine. But is it just a crass moneymaking exercise, or is it actually a good SUV? Well, it could be argued that Bentley didn’t even have to make a good SUV; one that was obviously enough a Bentley from the outside, nice enough on the inside and with a high enough price tag to keep the riff-raff out would probably have been enough to guarantee a good sales volume and profits. But Bentley isn’t in the business of making bad cars. I’m not sure there’s ever really been a “bad” Bentley, especially after Volkswagen brought the storied marque into the 21st century. And they’re all kind of the same—they’re very big, they’re very heavy, they’re flashy as all hell, they’re very plush inside, they have ginormous engines, and they’re very fast. The Bentayga is all of those things too; it has all the subtlety and nuance of a Zack Snyder film. You can see where an SUV fits right into that ethos, especially in this era of cheap gas and booming luxury SUV and truck sales. And Bentley in general is not a brand for old money, it’a a brand for people who were successful in life and want to show the world they made it. The Bentayga is the right vehicle for the right time. And Bentley is absolutely taking a page out of the Porsche playbook here, specifically the chapter titled “Cayenne”, wherein an established luxury automaker builds an SUV off a company platform (in this case, the Audi Q7's) and uses brand image to sell to the masses who respect that image, but would never have considered one of the less cars before. Step 3: Profit. Sometimes those roots show a bit too much, and it just doesn’t feel as Bentley-ish as other Bentleys. But that’s probably not going to hurt it. From the outside the Bentayga gets the job done: it’s a Bentley SUV. It tells the world you’re driving something huge and expensive and very, very nice. It’s big, brash, and it screams to the world that you’ve done okay for yourself. That “Quiet Luxury” Lincoln is slinging these days? This is the opposite of that. The front seems straight grafted from the Continental, and one of the “jewelry”-equipped headlamps looks like it costs as much as my entire student loan debt to replace. The wide rear haunches give the Bentayga an aggressive stance, and the B-shaped taillights and quad tailpipes are nice touches too. It’s not especially elegant, not the way the coupes, sedans or the EXP 10 are. 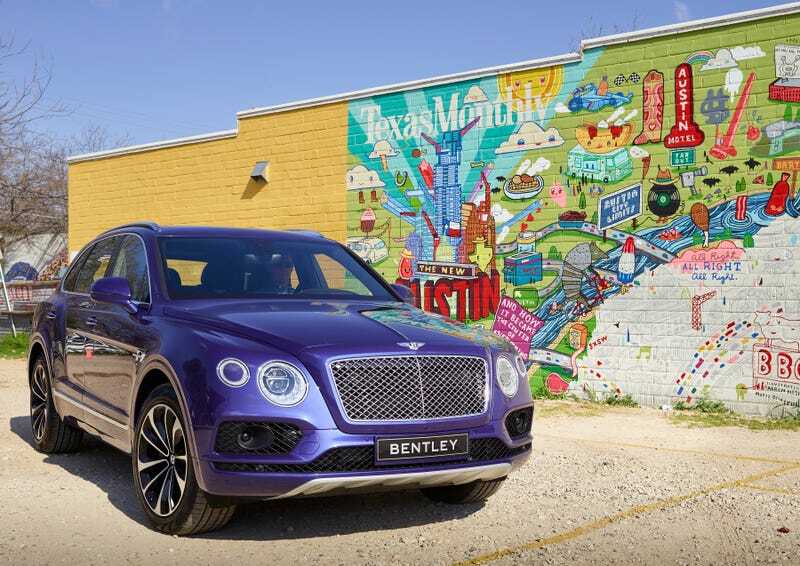 But I will give Bentley huge amounts of credit for offering the Bentayga in all sorts of bonkers colors, like Azure Purple. Or if you go with the bespoke Mulliner customizer option, literally any combination of colors you want. Any. Colors. You. Want. That’s real luxury. The real magic with a Bentley happens inside. And man, does the Bentayga not disappoint! Mostly. Step inside. Brace yourself for an explosion of wood, chrome, carbon fiber, or brushed metal, depending on your options. And quilted leather. So much quilted leather. Like all Bentleys, this one is handmade in England. Where do I even start in here? Twenty-two way power seats with massaging, heating and ventilation; tablets for the rear passengers mounted behind the front seats; a 1950-watt, 18-speaker Naim sound system; even a clock that nearly costs as much as the car itself. Goodness! Yes, it’s all very nice. But it falls down particularly on the parts the driver interacts with. All of those switches buttons on the steering wheel? Pick any Audi, that’s where they come from. The buttons around the infotainment system look lifted straight out of a Volkswagen Golf. Same with the light switches and the gauge cluster, particularly its center screen. None of this is bad, per se, and the kit comes from a nice car. But it adds up to make an interior that never feels as special, as unique, as the Bentley sedans and coupes do. It’s nowhere near the level of, say, a Bentley Mulsanne, though that it is admittedly more expensive; I’d wager it doesn’t seem as good as the similarly-priced Continental either. Aspects of this car make it feel more like the world’s nicest and most expensive Q7 than a true Bentley SUV. This is one of them. You can be forgiven for feeling that way during the drive too. I know I did. It’s smooth, quiet, pliant, even a bit boring. There were times on a long trip through the Hill Country where I forgot I was even in something as outrageous as a Bentley. Then I put the accelerator to the floor, and that put to rest any notions that the Bentayga may not be “special” enough. Holy crap, is this thing fast, but effortlessly, fearlessly so. Like a slightly crazy, SAS-trained butler who enables his employer to do all sorts of ill-advised things, the twin-turbo 600 HP W12 simply asks “Would sir (or madam) like to reach speeds that are extravagantly illegal today?” Then it does it. No drama, just triple digits instantly. It will also go from a stop to 60 mph in just four seconds flat. It feels much quicker than that in real world applications, but it never delivers that speed in an uncouth, or manic way. The blitz of power is as refined as anything else on this machine. Handling-wise, it’s hardly a corner-carver due to its massive weight and girth. This thing comes in at 5,340 pounds, almost 1,000 more than a Porsche Cayenne and several hundred more than a BMW X6 M, so you don’t expect great results if you want to hustle it around a track. (Not that anyone will.) Body roll, however, stays flat thanks to a 48-volt circuit that controls a trick electromechanical active body roll stabilization system. Basically, that system adjusts the stiffness of the front and rear anti-roll bars on the fly; you’ll find the same thing on the upcoming Audi SQ7. Bentley’s clearly looking to at least try and offer something that ones-up the Range Rover crowd with a little dial that controls the All-Terrain settings so the car can be optimized for driving in different environments, two of them off-road. Ride height can be adjusted with the air suspension, there’s gadgets like hill descent control and surround cameras, and Bentley says the engine can supply oil even when climbing a 35 degree grade. Whether it can really out-wheel a Range Rover is dubious in my book, as is the idea that anyone would ever actually do that in a Bentayga. But the options are there to at least allow people to try. So my favorite thing about any Bentley is the options list. Besides obscene, physics-defying horsepower, this is what Bentley does better than almost anyone. Four seat comfort specification with rear console: Want a classy limo-like experience instead of a rear bench seat, and do you want it with USB ports and individual foot rests? You can have that! Price: $11,015. That clock I mentioned? It’s a self-winding timepiece called the Mulliner Tourbillon from Breitling, and it’s a machine almost as sophisticated as the Bentayga itself. And nearly as expensive. Price: $160,000. Naturally, the Bentayga is the ideal vehicle to take to your next SMU tailgate, and so it can be had with a motorized “event seat,” a bench that extends out of the rear hatch and is covered with the same quilted leather as the rest of the interior. Price: $3,200. “Hampers”: In America that’s where your dirty clothes go. On the Bentayga, however, that means removable boxes in the rear hatch full of champagne, crystal and fine china. You can tailgate with this too; I am all-but certain it can accommodate a 12-pack of Lone Star. Price: $28,000. And so much more, probably including a secret list of options that normal people like you and I aren’t even told about. You have to be in the Illuminati at least six generations before you get to see that spec sheet, I am sure. The Bentayga is the luxobarge to end all luxobarges. It’s a vehicle so ridiculously over-the-top, so unapologetically and happily opulent, so sure of what it is, you can’t help but love it. Hell, the fact that Bentley made the fastest SUV in the world alone is reason to respect this crazy thing. Yes, there’s some Audi roots in some perplexing places, but if those are the only real faults I could find in an SUV that cost a bit over $275,000 as tested here with options, I’d say yes, it’s a win for Bentley. It will make its buyers very happy indeed. If they can even get their hands on one—the first year’s production run is already sold out. Hey, what’s high-end luxury if not exclusive?